Inspired by the distinctive characteristic of each gemstone, Elaine artistically creates exclusive designer jewelry using combinations that compliment each other. Sparkling faceted gemstones are coupled with rough herkimer diamonds, rough apatite or rough tourmaline to give a fresh, edgy look. Smooth glowing rainbow moonstone, labradorite or larimar are combined with cut and rough stones that accent and enhance each stone’s unique pattern and color. Our jewelry will attract customers to your store and keep them coming back to see what’s new. One store owner and long time customer commented, “Your jewelry is selling faster than anything else! Your gemstones and designs are SPARKLICIOUS!” Sparklicious is the best word to describe our latest designer pendants. By staying alert with the ever-changing business climate of the times, Elaine provides you the most adaptable, quality jewelry pieces at prices that are hard to beat. Our designs attract Millenials to Baby Boomers. 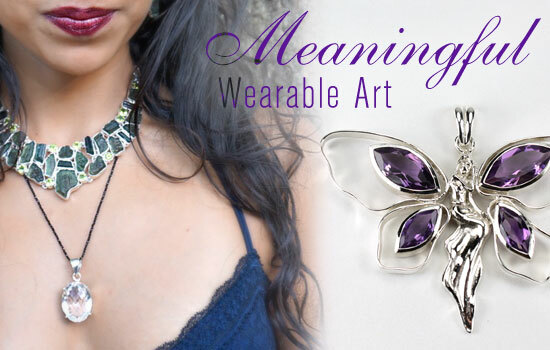 Keeping in mind that most of us have busy lifestyles that often require us to quickly dress up or down, Elaine designs practical, versatile jewelry of which one piece can easily be worn as a feel-good everyday casual favorite, a subtle statement of graceful power in the workplace, a charming conversation piece at a party, or a romantic touch for those special times.